This jacket is a reproduction of an Aero Leather Clothing Co. (of Beacon, N.Y.) A-2 contract from 1941. This jacket is quite unique compared with other Aero contract models, in that it has a number of features from earlier Aero contracts, and is the first contract to use some newer details. The fit of this contract is comfortable, and has reasonable dimensions of the shoulders, chest, and sleeves, with good sleeve length and body length. Originals were made in both russet and seal horsehide, and possibly cowhide. One can see many officers from the Doolittle Raiders wearing this same contract, and General Claire Chennault wore one while serving in China. His jacket is currently on display in the Air and Space Museum in Washington DC. This jacket looks smart and will have an ageless WWII profile. 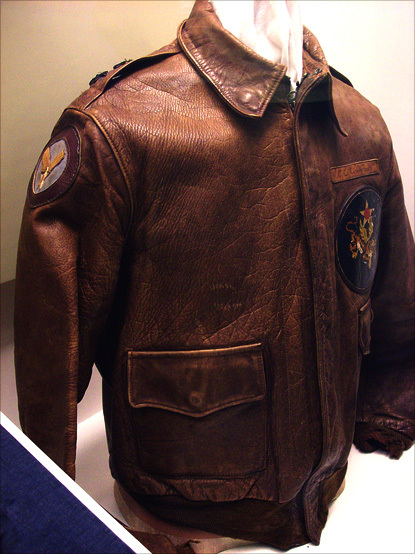 This photograph below shows General Chennault's original Aero W535-ac-16160 Type A-2 flight jacket on display in the Air and Space Museum, Washington, DC. Shown in the link below is a photograph of Lt. Thomas C. Griffin's seal brown horsehide Aero W535-AC-16160 Type A-2 flight jacket. Griffin flew as a member of Crew #9 with the Doolittle Raiders. Photo from the National Museum of the U.S. Air Force. » Click here for photographs of a size 44 Good Wear Acme W535-ac-16160 made with russet brown horsehide. Available sizes: 36 – 48 only. Please contact us for more information about this Good Wear Acme W535-ac-16160 Type A-2 through our e-mail: info@goodwearleather.com. © 2006-2007 Good Wear Leather Coat Company. All rights reserved.